Born: 10 October 1675, Doerflas, near Marktredwitz, Germany. Died: 31 December 1725, Neustadt an der Aisch, Germany. 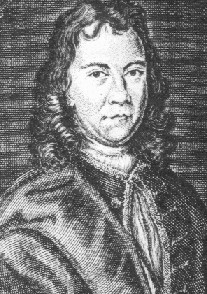 Peter Kolb (also Kolbe, Kolben), German writer on the Cape, received his early education at Marktredwitz and from 1688 at Wunsiedel, where he completed his schooling in 1694. He then attended the Sebaldus Gymnasium and subsequently the Egidius Gymnasium at Nuremberg, but his financial position became precarious some years after the death of his father in 1691. After working for some time as an assistant to the astronomer G.C. Eimmart he enrolled at the University of Halle in 1700, where he studied philosophy, mathematics, physics, logic, oriental languages and theology. He was awarded an advanced degree in 1703 for a thesis, De natura cometarum, on the nature of comets as natural phenomena. He then became the private secretary of Freiherr Bernhard F. von Krosigk, and tutor to the latter's son. Von Krosigk was interested in astronomy and decided to send Kolb to the Cape of Good Hope to undertake astronomical observations and study its physical features and natural history. His astronomical work was to include the determination of the geographical position of the Cape, and observations of the moon that would be used in combination with similar observations made in the northern hemisphere to determine the earth-moon distance. He obtained the necessary astronomical instruments in Amsterdam, the Netherlands. Kolb left the Netherlands on 8 January 1705 in the Unie, a ship of the Dutch East India Company. The company offered him some support for his work at the Cape, including a pendulum clock, provided that he would leave his instruments there and train an assistant to continue his observations. Having learned some Dutch during the long voyage, he arrived at the Cape on 11 June 1705. He was well received by Governor W.A. van der Stel* and provided with accommodation and facilities for his studies. His astronomical observatory was situated in the Buren bastion of the Castle. Fairly soon after his arrival he determined the latitude, longitude and magnetic declination of his observatory. His latitute (34 deg 15' S) placed Cape Town about 20' too far south, but his longitude was more accurate than the value found by Father Guy Tachard* in 1685. The magnetic declination he found to be 11 deg 55' W in 1707. These results were reported to Baron von Krosigk for possible publication. However, in general little progress was made with his astronomical observations and his relations with the authorities deteriorated when he sided with the colonists in their grievances against Governor van der Stel. None the less he collected much information about the colony, and particularly about the local Khoi. Though von Krosigk died in 1709 and Kolb's stipend ended, he remained at the Cape. In February 1710 the authorities threatened to deport him unless he started paying taxes and doing burgher duty; as a result he accepted an appointment by the Dutch East India Company in 1711 as secretary to the Court of the Landrost at Stellenbosch. Here he continued collecting information, until failing eyesight led to his discharge and forced him to return to Europe in April 1713. He does not seem to have travelled into the interior beyond Stellenbosch, but did visit the warm baths at "Black Hill" (near present Caledon). After treatment in Rastatt, Germany, his vision improved and he returned to his home in 1715 to spend the next few years writing. In 1718 he became principal of a secondary school at Neustadt an der Aisch, where he remained for the rest of his life. His major work on the Cape, Caput Bonae Spei hodiernum, das ist: Vollstaendige Beschreibung des Afrikanischen Vorgebuerges der Guten Hofnung... was published in Neuremberg in 1719. His portrait forms the frontispiece of the book, which contains 846 pages. The first part deals extensively with the Khoi. This is followed by chapters on the natural history of the Cape. From a historical point of view his description of the Khoi and their way of life is the most important part of the book, as their culture had not yet been much changed by European influences. However, his account contains various unfounded speculations and seems to be partly based on earlier descriptions by Guy Tachard and others. Though Kolb had no training or special interest in natural history, his book contains the first published lists of the Cape fauna, with a number of illustrations. The lists of mammals, birds, reptiles, land invertibrates, fishes and other sea animals are quite extensive, but his brief descriptions contain little specific or new information. None the less they were of considerable interest at the time. Kolb's memory is perpetuated in the popular name of the Cape or Kolbe's vulture. He also lists some 400 species of trees and other plants, having learnt something about the subject from J. Hartog*, the Dutch East India Company's gardener, but his list is largely based on existing manuscrips and books. In a section on the rocks, soils and minerals of the colony mention is made of peat, limestone and sand, but most space is devoted to speculative theories according to which the Cape should be rich in minerals. In other sections he describes the production of salt, the weather at the Cape, hot springs (including his personal observations of those near present Caledon), and diseases among the settlers and their cures. A Dutch translation of the book was published in 1727, an abridged English translation in 1731, and a French edition in 1741. It was the most comprehensive description of the Cape to date, and remained very influential for several decades despite criticism of the accuracy and originality of its information by F. le Vaillant*, N.L. de la Caille*, A. Sparrman* and others. Kolb was not married and lived with his sister. He died of a lung complaint. Bauer, A.M. Early German herpetological observations and explorations in southern Africa, with special reference to the Zoological Museum of Berlin. Bonner zoologische Beitraege, 2003, Vol. 52, pp. 193-214. Forbes, V.S. Some scientific matters in early writings on the Cape. In A.C. Brown (Ed. ), A history of scientific endeavour in South Africa (pp. 33-59). Cape Town: Royal Society of South Africa, 1977. Kolben, Peter. The present state of the Cape of Good Hope (translated from the German by G. Medley). London: W. Innys, 1731, 2 vols. McKay, H.M. Who's who in South African ornithology. Bokmakierie, 1948, Vol. 1(3), pp. 41-43; reprinted in 1966, Vol. 18, pp. 33-35, 64-65. Moore, P. & Collins, P. The astronomy of southern Africa. Cape Town: H. Timmins, 1977. Moritz, E. Die Deutschen am Kap unter den Hollaendischen Herrschaft, 1652-1806 (pp. 70-71). Weimar: H. Boehlaus, 1938. Rogers, A.W. The pioneers in South African geology and their work. Transactions of the Geological Society of South Africa, 1937, Annaxure to Vol. 39, pp. 1-139. Smuts, M.E. A history of geodesy in South Africa. South African Survey Journal, 1926, Vol. 2, pp. 9-15, 68-76, 118-124, 167-179, 211-218 (see pp. 72-76, 118).